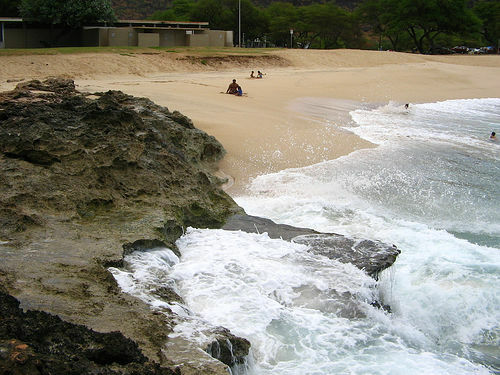 Nanakuli beach park is in an area where it had been customary to name places after a body part – Nanakuli literally means to look at the knee. This is an interesting beach and offers a diversified recreational activity menu. Principal ocean activities are swimming, snorkeling, SCUBA and skin diving. Swimming is generally safe during the Summer months, but becomes very dangerous during Winter high surf season. Snorkelers’ and divers should watch out for Winter’s strong currents and turbulence. 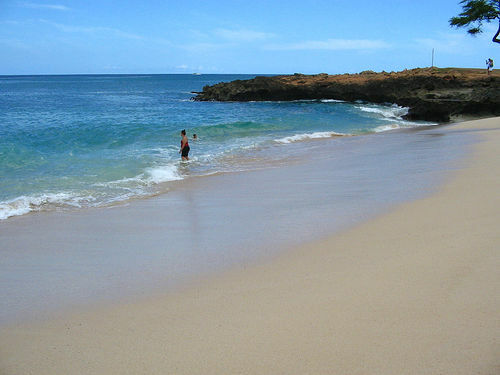 Nanakuli Beach OCEAN INFORMATION — For a detailed description of the Pacific Ocean’s marine climate, water properties, currents, tides, waves, etc., please visit The Ocean Atlas of Hawaii online. You’ll learn many interesting facts, like our average surface water temperature in Winter is 75 F (24 C) and 81 F (27 C)in the Summer.Call 596-SURF (that’s 596-7873) to hear a recorded message on conditions at various O`ahu beaches. The recording is a free service of the Surf News Network (SNN) and is updated four times a day, 365 days a year, at 7 a.m., noon, 3 p.m. and 7 p.m. In addition to wave heights, SNN provides information on winds, tides, and buoy readings.